After hours of driving or flying, you have (finally) reached your destination at Spinnaker Resorts! You’ve checked in to your room, unloaded all of your luggage and you still have a few hours to make your way out to the beach before the sun sets. The sand is hot and the ocean is glistening. The waves are just right for your adventurous evening. What do you do? Do you grab your surf board or your stand-up paddle board? Surfing originated in Tahiti and Hawaii in the 18th century. Surfers back then had a real connection with nature and the ocean. Surfing is an ocean/watersport in which the wave rider, referred to as a surfer, rides on the forward or deep face of a wave which is usually carrying the surfer toward the shore. You might be more inclined to try surfing, if you are staying at Royal Floridian on Ormond Beach in Florida! There are a variety of waves for everyone from beginner to expert levels. If this is your first time surfing, try taking a class or go out with a group. There are multiple types of surfing including long boarding and short boarding. These two types have several differences including the board design and length, riding style, and the kind of wave that best suits each board. If you are a beginner, all waves can look similar. Look for the medium to large (2.5 meters) waves that will help push you along the ocean’s trough. If you are looking for the best location to surf on Hilton Head Island, my favorite spot is Burke’s Beach. 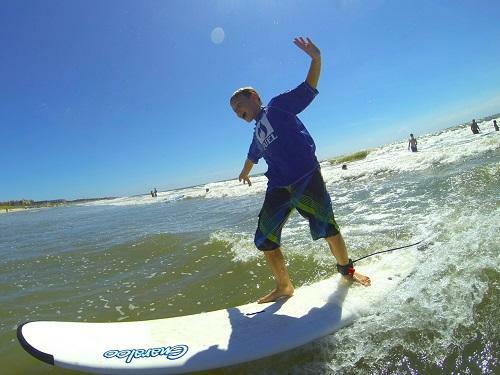 Contact Fuel, if you are interested in joining a surf camp on Hilton Head Island. Surfing is an exciting sport that can be difficult to pick up, but once you have experienced it you’ll be bringing your surf board to your vacation home every year! Stand-up paddle boarding (SUP) is a type of surfing that originated in Hawaii. Unlike traditional surfing where the rider sits until a wave comes, stand up paddle boarders stand on their boards and use a paddle to propel themselves through the water. The idea of gliding through the water is what attracts people to multiple types of stand-up paddle boarding. Variations include flat water paddling for outdoor recreation, fitness, or sightseeing, racing on lakes, large rivers and canals, surfing on ocean waves, paddling in river rapids, paddle board yoga, and even fishing. I love to paddle board on the Intracoastal Waterway around Hilton Head Island. The rivers in this area are calm and quiet, and it’s a great place to interact with wildlife. When stand-up paddle boarding in the ocean you have to be alert at all times. Be sure to keep a watchful eye on your surroundings. Personally, I think stand-up paddle boarding is the most relaxing water sport that I have participated in. Anyone at any age can learn to surf or SUP and must have at least intermediate swimming skills. Although the board assists a surfer in staying buoyant, it can become separated from the user. Surfers should be careful to remain in smaller surf until they have acquired the advanced skills and experience necessary to handle bigger waves and more challenging conditions. Make sure to tell someone when and where you are heading out. Whether you decide to surf or stand up paddle board, remember to be safe. The ocean laws in every state are different. In the state of South Carolina, you must have a life jacket on your board. You don’t have to wear the life preserve, but it does need to be placed on the board. Be safe and have fun! 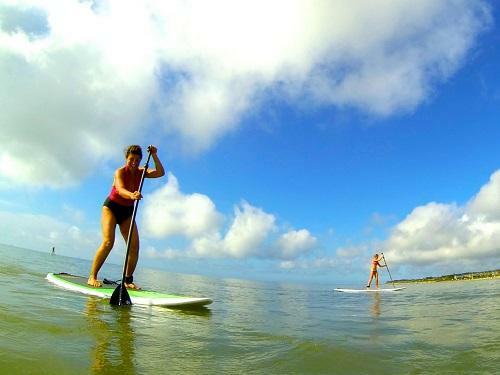 Are you going to try surfing or stand up paddle boarding on your next vacation? Share with us on Social Media.